With 2016 behind us now, these are some of the films being released this year that I am looking forward to seeing the most - simply sorted in order of release date. Enjoy, and watch out for reviews on most of these movies over the course of the year! This is a bit of a bittersweet start to my list, as this will be the last time that we see Hugh Jackman take on his signature role of the Wolverine (aka “Logan”). The movie is supposed to be largely inspired from the “Old Man Logan” comic book storyline and takes place in a post-apocalyptic future. Expected to receive an “R” rating, Logan will mark the tenth installment in the X-Men movie series as well as the third Wolverine solo film, following 2009’s X-Men Origins: Wolverine and 2013’s The Wolverine. While I certainly wouldn’t call myself a big King Kong fan in general, I am still pretty excited to see this movie. So far, the trailers have looked awesome and it seems as if they are going to do an exceptional job of capturing the sheer size of Kong in this film. A follow up of sorts to 2014’s Godzilla, this movie is building up to another live action adaption of a fight between cinema’s two most iconic monsters with Godzilla: King of Monsters set for release in 2019 and Godzilla vs. Kong slated for 2020. To say the least, this franchise has changed a lot since the release of the 2001 original. The films have gone from stories centered on street racing to what have basically become full-fledged superhero movies. I think they really hit a peak, with a nice balance of those two elements in 2011’s Fast Five, one of my favorite action movies of all time. That being said, I am still looking forward to seeing what they do with this eighth installment, even though the last two movies have been a bit too over the top for me. This highly anticipated sequel is the first of three films coming from the Marvel Cinematic Universe this year. I am a huge fan of the 2014 original and I think that it remains one of the best and most creative efforts of the franchise to date. Vol. 2’s marketing campaign has been just as good as the first so far and the trailers for this new movie have me really excited to see what Marvel will bring to the table this time around. Admittedly, I am not completely caught up on all of the Alien/Predator movies, but I am still going to give this new movie a shot, largely since it has legendary director Ridley Scott at the helm once again. The 1979 original Alien and its 1986 sequel Aliens stand out as two of my favorite science fiction films ever and I am really interested to see how they expand on this developing prequel storyline of the franchise. I grew up loving the Pirates films and Johnny Depp’s signature character of Jack Sparrow is definitely one of my favorite movie heroes ever. 2011’s On Stranger Tides was a letdown for me. However, I am optimistic that Disney has a chance to bring the franchise back to life this time around, with the fifth installment of the series. Hopefully Javier Bardem’s role as Captain Salazar will be enough to save this movie since he has historically played an excellent villain in movies such as No Country for Old Men and Skyfall. This movie follows Man of Steel, Batman v Superman and Suicide Squad as the fourth installment in the DC Extended Universe. It is fair to say that I enjoyed each of those films more than the average critic - being a big fan of the source material. Anyway, I really liked the work that Gal Gadot did as Wonder Woman and the trailers so far have me really excited to see the first live action, stand- alone movie for the iconic character. I am hopeful that this will be one of the best comic book films of the year. To be completely honest, I may not even give this movie a shot unless I see some improved trailers and/or positive early reviews. The teaser did not impress me too much. In my opinion, the Transformers franchise has only gotten worse since the 2007 original, which was one of the films that really got me into movies in the first place. The Last Knight still deserves a spot on this list, simply because I am curious to see if director Michael Bay has a chance to finally save this deteriorating series. With Sony Pictures and Marvel Studios now cooperating with creative control over Spider-Man, this movie will serve as a second reboot for the character following the relatively unsuccessful pair of Andrew Garfield films. We already got a sneak peek of the young Tom Holland’s take on Spidey in this year’s Captain America: Civil War and personally, I think that might just be my favorite adaption of the character. Because of that and an awesome first trailer, I am pretty pumped to go see this movie. I am a huge fan of each of the first two Apes reboot movies (Rise in 2011 and Dawn in 2014), so I am pretty excited to see what this next film has in store for us. Andy Serkis is the king of capture and it looks like he is going to deliver another amazing performance as the lead monkey, Caesar. This movie will also feature Woody Harrelson in a villainous role, so I have a good feeling that this will end up being one of the best science fiction movies of the year. While Christopher Nolan has only directed eight full length movies, I have seen them all, from 2000’s Memento to 2014’s Interstellar. Each film is a masterpiece in my opinion. I strongly believe that he is the best director in Hollywood right now and I cannot wait to see what he does with this next movie. Dunkirk stars Tom Hardy (one of the best actors in the business right now) and depicts the Dunkirk evacuation of World War II. I really think that this movie has the potential to win multiple Oscars this year. 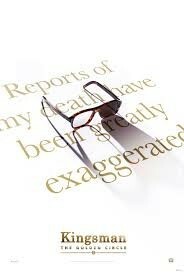 I think that 2014’s Kingsman: The Secret Service was one of the best movies of that year and is honestly one of my favorite action films of all time as well. It seemed like a Quentin Tarantino/James Bond movie and I have an absolute blast every time I re-watch it. With Matthew Vaughn directing again and a handful of big name actors and actresses added to what was already a strong cast, I expect a lot of the same great things from this sequel. I really can’t wait for it to hit theaters in the fall. While 2011’s Thor and 2013’s The Dark World were each pretty decent, I would not categorize either of them as great Marvel movies. But, I think that Ragnarok has the potential to be one of the franchise's best films yet. Not only will we see the God of Thunder in his third standalone movie, but this film will also have the characters of Doctor Strange and Hulk in it as well. What I am most excited for is the likelihood of scenes featuring Planet Hulk, a comic storyline in which Hulk fights in a gladiator arena in space. As I mentioned before, I am a huge fan of the DC Extended Universe thus far, so needless to say, I am absolutely ecstatic for the first live action adaption of this iconic superhero team. I think that they have done an excellent job setting the groundwork for Justice League and the first trailer looks promising. While I do love the Marvel Cinematic Universe, I have always preferred DC characters and I think it is the perfect time for them to start competing with their own movie franchise. Ironically enough, the last movie on my list is also my most anticipated film of 2017. While we do not even have a full title yet, the ending of my favorite movie of 2015, The Force Awakens, clearly set up what should be an incredible sequel. Episode 8 will answer a lot of questions brought to attention by its predecessor and also really progress the epic storyline of this amazing saga. However, the bottom line is that Star Wars is back and each film that comes out has become a worldwide event at this point.